Meet Popcorn and Marshmallow, two very lucky kittens who narrowly escaped being trapped in a bonfire thanks to a ‘tiny meow’ that alerted a groundskeeper to their whereabouts moments before he walked away. Builder Rob Gillen was working in Andy Southcott’s garden when he made the discovery - Andy is his boss and the chairman of property developers Southcott Homes. After Rob discovered the pair of kittens at his boss’ home in Southampton, Hants, he pulled them from the pile and informed Debbie, Andy’s wife. 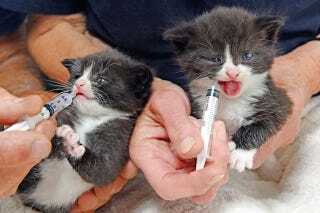 Debbie immediately took them to the Blue Cross rehoming centre in Southampton. It is believed the mother of the two kittens is a stray cat that has regularly been spotted around the area.